Simon Reich: Does it matter who wins the election when it comes to the Middle East? You are here: Home / Zombie Categories - Do Not Use / Election 2016 / Simon Reich: Does it matter who wins the election when it comes to the Middle East? Elections, the perennial wisdom tells us, are generally not decided by foreign policy issues. But who’s to say that 2016 will not buck the trend, as it has in so many other ways? We are potentially only one Paris-style terrorist attack or a brazenly aggressive act by Russian President Putin from changing the mood and focus of the American electorate. Indeed, Republican voters already consider terrorism their primary concern. And the never-ending, slow drip release of Hillary Clinton’s Benghazi emails is certain to return the spotlight to foreign policy. So let’s take a look at how the candidates stack up in the most contentious region in the world: the Middle East. Let’s look at the three major Republicans left in the race. Donald Trump has actually said very little about foreign policy, especially about the Middle East. In fact there are essentially few discernible differences between Trump’s position on the region and those of his main rivals, Ted Cruz and Marco Rubio. While Trump says little, Cruz’s position is one-dimensional. He would rely on brute force. Cruz has said he wants to “carpet bomb” the Islamic militants and find out whether “sand can glow in the dark.” But there isn’t much beyond that. Still, it is more than Trump has offered which is to “behead” the Islamic State, or ISIS, and steal their oil. Rubio’s position is the most fleshed-out, probably because he has the most foreign policy expertise and has spent time working on the Senate’s Foreign Relations Committee. Not surprisingly, therefore, he also offers the most comprehensive plan for dealing with ISIS, the central focus of his plans for the Middle East if elected. Hillary Clinton, of course, has by far the most foreign policy experience of any candidate left in this year’s field – and arguably among the most of any in history. First Lady, Secretary of State, the Clinton Foundation: she has a unique resume. So how do Clinton and the Republicans compare when it comes to American policy the Middle East? President Obama has often, I believe unfairly, been accused of having no grand strategy at all, let alone one for the region. The consensus among American policymakers is that there are are four enduring interests for the U.S. in the Middle East: oil, regime change, terrorism and the protection of its allies (always Israel and, more variably, Saudi Arabia). Then there are also always a series of proximate issues that dominate the press – like Iran’s nuclear program or ISIS’ conquests. The differences between these candidates are which they prioritize, and how they approach them. This approach relies on a combination of tools – diplomatic, economic, military, political, technological and cultural – in the pursuit of foreign policy. and would employ the same cocktail: for example, to defeat terrorist groups like ISIS. But while she favors a no-fly zone to protect civilians in Syria, she eschews the idea of American forces entering a Middle Eastern ground war at this point. 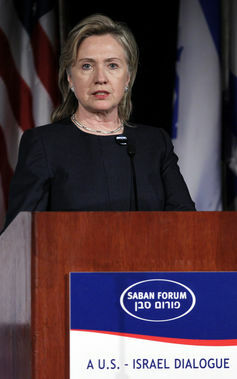 So, right or wrong, she appears to have learned some lessons from the Iraq debacle and the shorter Libyan intervention. All presidential candidates talk about the essential role the U.S. plays as a “leader.” But, when they use that word, they don’t always mean the same thing. Generally, Clinton favors the kind of influential multilateral approach to leadership adopted by the Obama administration in the negotiations with Iran over its nuclear program. There it saw itself as a “first among equals”: that is, a member of a group who is officially on the same level as the other members but who has more responsibility or power. In practice, that means that the U.S. sets the agenda and largely defines the approach to problem, even as it seeks and acts on the basis of consensus. It also means that its policymakers anticipate the need to compromise. John Kerry epitomized that approach in the exhaustive negotiations with the Iranians. The Republicans all rely on a very different set of principles in defining their general strategy. It is one that policy wonks and academics label “primacist.” A primacist approach relies much more on military power than Clinton’s more balanced elixir when it comes to foreign policy. Cruz, for example, simply wants to destroy what he calls “radical Islam” from the air through carpet-bombing. Rubio’s view is more developed. His view of leadership entails a rhetorical reference to multilateral coalitions. But still, like Cruz or Trump, he has a far greater willingness to act unilaterally without regard to the concerns of organizations such as the United Nations. 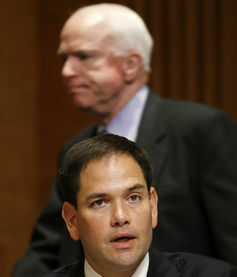 Senator Rubio at the Senate Foreign Relations Committee (with Senator John McCain in the background). So it isn’t surprising that Rubio’s stump speech includes lots of references to rebuilding and modernizing the military in the face of what he characterizes as “devastating” recent defense cuts. Indeed, Trump has said it would be his first order of business if elected president. Obama tried to construct a national security strategy that conserves American power. Clinton advocates much the same. But the Republicans’ philosophy is based on the belief that the aggressive use of American power will only make it more powerful. Unlike Clinton, Rubio, for example, would aggressively support regime changes in both countries. The Republicans reject what Obama characterizes as “strategic patience” an approach that emphasizes the importance of awaiting changes to slowly unfold in both countries. Nevertheless, there are some areas where Clinton and the Republicans would likely enforce similar policies. These are areas where every president, including Obama, have been remarkably consistent. The U.S. Navy, for example, protects freedom of navigation in the Straits of Hormuz off Iran’s coast. Their goal is to ensure that world markets are not roiled by a sudden shortage of Middle Eastern oil caused by sabotage of tankers passing through this narrow waterway. And they’d all maintain a close alliance relationship with Israel, although – based on their rhetoric – the Republicans would be exceptionally uncritical. Clinton, for her part, has consistently supported Israel and has links to America’s Jewish community that can be traced back decades. But her support of the Iran deal has cast a doubt in the minds of some of Israel’s supporters as to her fidelity when it matters the most. At the end of the day, the policy differences between Clinton and the leading Republicans are occasionally stark. At other times, however, they are unclear. If we are to believe what they say (which is always an issue in any election season), then the chances of America entering a new ground war in the Middle East will significantly increase under a Republican president. Their style would be more forceful as they rely more on American military power as an instrument of change. Clinton’s style and tone would differ. Looking at the success of the Iran agreement, she might be tempted to rely more on multilateral diplomacy as a first option and force as a last – even if it means negotiating with people she doesn’t like. Then again, despite her impressive resume, Clinton might feel that she has to demonstrate some resolve, as America’s first female president, to address any lingering doubts. And in the Middle East there is no way of knowing where that will lead. One thing is certain: whoever becomes president, there is no way that America will relinquish its continued obsession with the region. Simon Reich , Professor in The Division of Global Affairs and The Department of Political Science, Rutgers University Newark. His most recent book is Good-Bye Hegemony! Power and Influence in the Global System.